Actress Natasha Gregson Wagner, daughter of Natalie Wood and founder of the Natalie lifestyle brand and fragrance, also received the Courage and Hope Award at the gala. The night was rounded out with an energetic musical performance by Venice, CA-based rock band Revel Makes. For over 15 years, CoachArt has honed in on the proven power of arts and athletics to spark students’ imaginations, working with hundreds of volunteers to provide life-changing lessons to about 1000 young people. 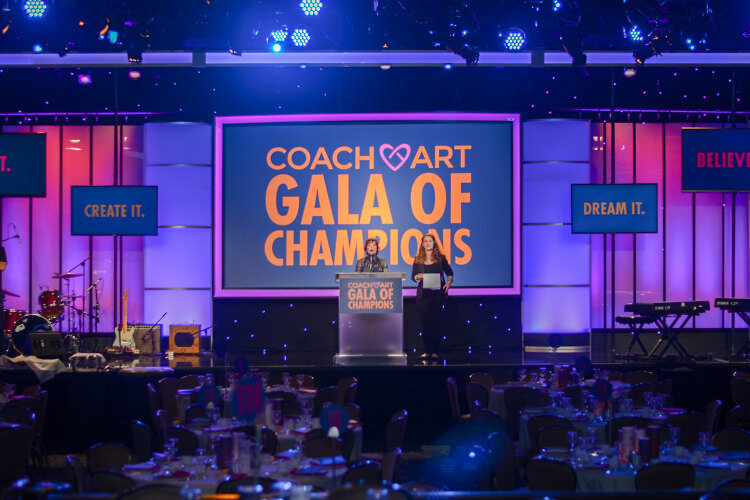 The annual CoachArt gala celebrates honorees for their exceptional professional success and personal humanitarianism. Business leaders, entertainment executives, community members, volunteers, and CoachArt families come together in support of the organization’s mission to create a transformative arts and athletics community for families impacted by childhood chronic illness. Each year it proves to be an inspiring fete. Click through for an inside look!